How much does it cost to travel to Curitiba? How much money will you need in Curitiba? R$42 ($11) is the average daily price for traveling in Curitiba. The average price of food for one day is R$19 ($4.71). The average price of a hotel for a couple is R$30 ($7.62). Additional pricing is in the table below. These average travel prices have been collected from other travelers to help you plan your own travel budget. How much money do I need for Curitiba? Curitiba is a relatively large city that is convenient to visit if you're traveling to Iguazu Falls from either Rio de Janeiro or Sao Paulo. It is worth a day or two stop over because it has a great old city that has been restored. It's also the capital of Parana, Brazil. 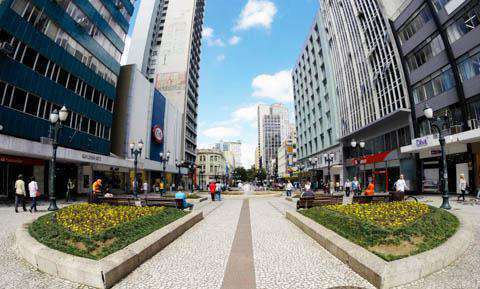 Curitiba is one of the more wealthy cities in the southern region of Brazil. It has a diverse population with many immigrants and some interesting cultural events. The city has an oceanic climate. It sits on a plateau and has flat terrain with flooded areas that keep the winters mild but damp. The average temperature during the coldest month is 45 degrees Fahrenheit and temperatures occasionally dip below freezing at night. During the summer months the average day time temperature is 77 degrees Fahrenheit but it can climb into the high 80s on the hottest days. There are some interesting attractions throughout the city, but do note that most are closed on Mondays and the tourist bus ceases to run on this day as well. Sights you might want to check out include several fountains such as the Jerusalem Fountain, Memory Fountain, and Maria Lata D'Agua Fountain. Pedreiras Park is worth a visit as is Curitiba Memorial, which uses art and traditional folk work to memorialize the city's culture. Other sights around town include Guaira Theater, Paiol Theater, Merces Tower, Rosicrucian Order, and the Sao Francisco Ruins. Parks in the city include German Wood, Barigui Park, Barreirinha Park, the Botanical Garden of Curitiba, Gutierrez Wood, Iguacu Park, and Passauna Park, among others. The most interesting part of Curitiba is the old city, referred to as cidade velha. It is well maintained and has been impressively restored. A particularly interesting time to visit is on a Sunday when there is a large arts and crafts fair that highlights a lot of the local handicrafts. This historical area has the oldest buildings in the city. These include the Romario Martins House and the Church of the Third Order of Saint Francis, which dates back to 1737. Tiradentes Square is the main square in the city. Basilica Cathedral Minor of Our Lady of Light is on the north side of the square. 24 Horas Street is between Visconde de Nacar and Visconde do Rio Branco Streets. It has many shops that are always open and is a great place for dining, nightlife, or relaxation. Santa Felicidade is along Manoel Ribas Avenue. This is the neigborhood where many of hte first Italian immigrants settled. This area has the greatest concentration of restaurants in town and there are many wineries and wine bars as well. Many visitors to Curitiba come specifically for the Serra Verde Express. This is a train that travels to the coastal town of Morretes and it can be enjoyed as a day trip from the city. The views are breathtaking as it descends into the Atlantic rainforest. The train departs every day at 8:15 in the morning. Curitiba has a range of good restaurants and bars. You can typically find something to fit your budget, whether it's a shoestring budget or you're looking for more of a splurge. Options include traditional Brazilian, Japanese, pizzerias, and even Swiss or Slavic. Because much of the population has European ancestry, there are a surprisingly large number of European restaurants and bars. The city's downtown area has restaurants that cater specifically to the business lunch crowd and close at night. On Sundays the downtown restaurants and bars are usually closed all day. The best way to travel around Curitiba is by public transportation. The city has a really great network of buses that navigate the city. There are at least three different types of buses that each fill different functions. Prices are cheap and the system is relatively efficient and easy to figure out. Special services run specific routes. The City Center Circulator travels throughout the city center. The Touristic Route connects more the 20 tourist attractions and lets a rider visit 4 different attractions without paying an additional fare. The Airport Shuttle is operated by minibuses that connect the city's downtown with Afonso Pena Airport. Alternatively, you can travel from the airport to the downtown by a city bus called "Aeroporto". This option is cheaper than the airport shuttle. Looking for a party in Rio de Janeiro or Sao Paulo? A great day excursion from Curitiba is to takethe Serra Verde Express to the town of Morretes on the coast. Its a beautiful, scenic route along the way and passes through the Atlantic rainforeset. You can catch the train at 8:15am any morning. There are classes of tickets, but the reality is the difference is too substantial, so buy the cheapest you can. Often the economy class is sold out so plan accordingly.